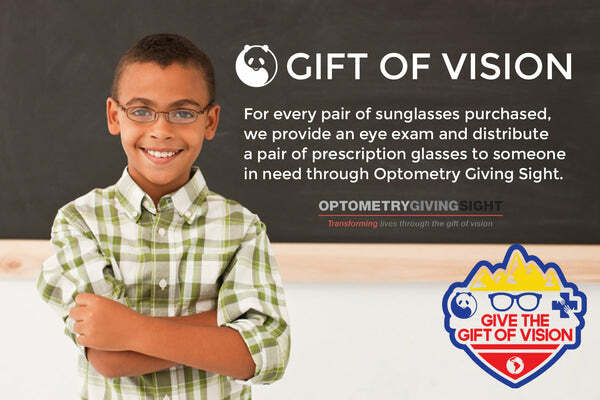 Panda is proud to partner with Optometry Giving Sight, a non-profit bringing eye exams, prescription glasses, and medical training to underserved communities. We are committed to visionary change, which is why every time someone purchases a pair of Panda Sunglasses from our Original or Ultralight collections we donate an eye exam and new glasses to someone in need. Vision is a gift often taken for granted. But for the 600 million vision-impaired who lack access to basic eye care, clear vision can remain maddeningly out of reach. The solutions are available; the challenge is getting them to the people most in need. Here at Panda we care about substance as much as style, which is why we've partnered with Optometry Giving Sight, a global fundraising initiative changing the way people see. With projects in 37 different countries (including the U.S.), Optometry Giving Sight provides eye care services to over 7.6 million people, training 14,000+ professionals and supporting 133 vision centers. These projects change lives for the better today and are setting the foundations for a brighter tomorrow. The leading cause of vision impairment across the globe is what's known as uncorrected refractive error. Or, more simply put, the need for an eye exam and a pair of glasses. A staggering 80% of all vision impairment is correctable, and yet lack of access to affordable eye care is often an insurmountable barrier. Optometry Giving Sight was founded in 2003 to address this disparity and eliminate refractive error vision issues in underserved communities. They train local eye care professionals, establish sustainable and culturally appropriate vision centers, and deliver affordable eye care and glasses. Investing in long-term strategies is a critical tenet of how Optometry Giving Sight structures their efforts. Education programs and schools of optometry are the first line of defense. Until recently, optometry did not exist as a profession in many developing countries, and even today in some areas there are literally no local eye care professionals. Training locals is one of the most important ways to ensure an ongoing, sustainable solution over time. These new optometrists and technicians are then an integral force in helping establish vision centers and labs in their communities. From our focus on eco-friendly bamboo to our support of educational initiatives, Panda is committed to sustainable solutions. It's not enough to just give glasses to those who are in need today; trained medical professionals and funded facilities are critical to ensure help is available for those in need tomorrow. In 2015 more than 1.6 million dollars was raised by Optometry Giving Sight. That money went on to screen nearly 4 million people, deliver more than 27,000 pairs of glasses, and support 16 optical labs and 116 optometry students. The numbers are impressive, but they mean even more when you consider the real world impact of enabling so many people to see clearly for the first time -- a child who can now see the chalkboard and advance in their education, or a parent with increased ability to provide for themselves and their families. The individuals impacted by the Gift of Vision program share stories of greater independence, reduced isolation, and more fulfilling lives. These are gifts we all deserve, and together these are goals we can achieve. Restoring sight can turn a life of poverty, into a life of opportunity. For many people, that's vision for life. Header image based on Tutorial: Making eyes pop by Caroline, which is licensed under CC BY 2.0.